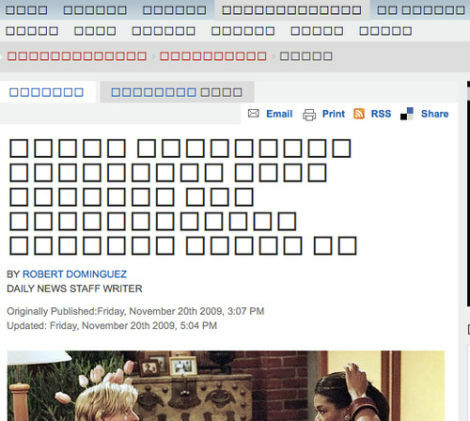 I mean, it's not necessarily gossip, per se, to note what a bunch of squares the people at the Daily News are, but when even the tech guys are messing with you like this, you've got problems. John Mayer reference? Maybe they're hiring. Just a thought. Oprah's quitting and some of her celebrity friends like Ellen are sad. But oh, hey look, MORE OF THESE GODDAMN SQUARES. Okay, well, this day's going to be nothing but strangeness, apparently. Have you ever seen someone blog with an ear infection? You're about to! I feel like I'm leaning exactly 23 degrees to the left. Here's a song, let's all get funky and just try to ride this one out, I guess. Happy Saturday!